The University of North Carolina at Chapel Hill recently began construction on a new facility that will be used for research on brain injuries, according to Vice President for Facilities Planning and Development Ray Lafrenaye and a Chapelboro.com news article. The facility will be named the Comprehensive Physical Medicine and Rehabilitation Center and is being constructed in the former University of North Carolina at Chapel Hill Border’s bookstore building on Fordham Boulevard. The center is planning on opening for operations in the next few months. Biotechnology vendors and lab suppliers looking for a market for laboratory equipment sales will find the University of North Carolina at Chapel Hill to be incredibly well-funded, according to recent NIH and NSF research funding statistics. In 2012, the NIH awarded the university $367.8 million. The research funding was distributed among a number of departments. For the convenience of our readers, we have composed a list of some of the best funded departments at the University of North Carolina at Chapel Hill. For a full list of the departments receiving research funding, visit the NIH website. 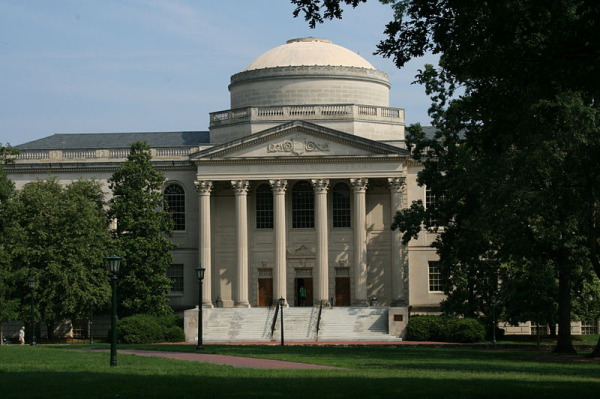 In addition to receiving money from the NIH, the University of North Carolina at Chapel Hill also received $38.8 million in research funding from the NSF in 2012. $11.5 million of that money went to the bio department alone. The bio projects receiving funding varied from plant genome research, physiology and structural systems, genetic mechanisms, bio informatics, systems and synthetic biology, molecular biophysics, global systems science, evolutionary processes, cellular dynamics and function, and developmental systems. In total, the University of North Carolina at Chapel Hill received $406.6 million in research funding from the NIH and NSF. Given its wealth of economic resources, the University of North Carolina at Chapel Hill is a great market for laboratory equipment sales. Don’t miss out on getting to know this well-funded market! Biotechnology Calendar, Inc. invites biotechnology vendors and lab suppliers interested in meeting science researchers at the University of North Carolina at Chapel Hill to attend our annual Chapel Hill BioResearch Product Faire™ Front Line Event on May 8, 2013. Biotechnology Calendar, Inc. is a full-service science research marketing and events-planning company that runs trade shows at top research institutions across the country. For more information on University of North Carolina at Chapel Hill funding statistics, click on the button below. If you are interested in learning about the laboratory equipment sales market at a school closer to home, we encourage you to check out our 2013 calendar of events.